One of my favorite membership plugins out there right now is MemberPress. Why? Well, primarily because of how much fun its creator, Blair Williams, is to hang out with at conferences! Ok, even though Blair is an all-around great guy, that's not the sole reason we frequently recommend MemberPress to our WP Courseware customers for membership management with WordPress. It's because MemberPress is incredibly feature-rich while also including a well-planned admin UI which makes it intuitive and easy to configure. Believe it or not, this combination is difficult to find in membership and e-commerce plugins. Selling courses with MemberPress is super easy with our WP Courseware + MemberPress integration plugin. MemberPress allows you to sell membership levels, but you can also simultaneously sell digital products such as an ebook or software. Lastly, MemberPress allows your customers to be a member of multiple membership levels. This isn't the case with all membership plugins. Score! As you know, there are many membership plugins available in the WordPress ecosystem and each of them has its own strengths. Again, MemberPress has a great range of options but those options are not difficult to navigate. As you'll see in this tutorial, we will get MemberPress up and running with WP Courseware in no time at all. Here is a list of what you will need to get a site up and running with WP Courseware and MemberPress. Once your site is set up with WordPress, the theme of your choice, and the three plugins indicated above we can get going. Setup is a breeze with MemberPress. There is essentially one basic step to configure to get us set up to test a transaction. Other than that, we will take all the default setup options for now. The great thing is that even the account, login, and thank you pages are all created automatically (you can manually create and set these up but we will use the default for this tutorial). Click on MemberPress→Options and then click the Payment tab. Click the "+" symbol to add a new payment type. Name it something like "offline" and select Offline Payment as the Gateway. Next, click the Info tab and fill out the information there. The information is simply for tax calculations as well as information for receipts (this step is required to save all the option settings). Seriously...that's it! We're now ready to create a membership level, a course, and test this thing out! Remember, with MemberPress you are creating membership levels that can control access to posts, pages, categories, tags, feeds, and more. So, not only will you be able to control access to courses, but you will have full-blown, site-wide membership functionality at your disposal. One other cool thing I'd like to point out is that MemberPress integrates beautifully with bbPress so that you can control access to member forums as well. So you could not only associate a WP Courseware course with a membership level, but also provide members at that level access to their own private discussion area. Give the membership level a name. I realize there are many more options, however, we simply want to get a test product up and running. Once we test and get proof of concept, we can come back and do some additional configuration. You may or may not have an idea for your first course. If not, that's okay...we can create a simple, generic course for testing purposes. Basically, a course consists of modules, units, and quizzes. If you want more detail on setting up various aspects of the course, we have put together a handy playlist that will walk you step-by-step through each option to help you get started. Click WP Courseware→Course then click Add New. Type in a name for your course. Click the +Add Module button to add your first module. Give it a name and a description and click Add Module. Once you've added at least one module click the X to close the modal. Now hover over the module and click the +Add Unit link. Give the unit a title and some content and click Add Unit. Once you've added at least one unit click the X to close the modal. Once you've added in all your modules and units you can then click Publish. Now you have your first published course! You can go back and add in a description, configure the on screen and email notifications, add a certificate, assign prerequisites and assign the course to an instructor should you choose to do so. This is the step which actually connects one or more WP Courseware courses to a MemberPress membership level so that when someone purchases a membership level, they are automatically enrolled into the indicated course(s). Select your course or courses that you want to associate with the membership level. This is completely optional because the MemberPress account page has tab for the course outline and there is nothing need to configure that. However, if you want to create a separate course outline on a different page then follow these steps. The course outline acts as an entry point into your course. There are two different course outline shortcodes you can choose from based on how you are structuring your course(s). If you have several courses, you could use the dynamic outline or what we call the "course progress" page. The course progress page will conveniently display all the courses the user is enrolled in at any given time and their progress in each. However, the user must be logged in to see these course outlines. It's handy as a central course navigation point on member dashboard types of pages. The other course outline shortcode simply requires a course id parameter and will only display the course specified. This type of course outline can be viewed if not logged in, however, a user must be logged in and enrolled in the course specified in order to click on the hyperlinks which link to course units. Give your page a title like My Courses. Just choose something that your students will identify as the course outline page. Ensure that the slug is set to my-courses. This is optional, but doing this will be useful later in the tutorial. Insert the [wpcourse_progress] shortcode for the course progress page. For additional shortcode attributes, see the WP Courseware documentation page by clicking Training Courses→Documentation. If your theme supports full width pages, I would recommend using full width for the course outline page. Now let's set up a redirect URL so that users will see the course outline upon login. ClickMemberPress→Options. Click the Account tab and look for the Login & Logout section. Change the URL redirection for login to your course outline page. Obviously, you may want to create additional courses so that you can diversify your membership levels. As the title of this post implies, selling courses with MemberPress will allow you create multiple courses and associate them with various levels. You can even create multiple courses that associate with a single level. Alright...this is the exciting part because we get to test out a transaction as the customer will experience it! The best part is that once we get this working properly, we just need to polish up a few things and we can begin actually selling courses and creating income. Now that we have MemberPress setup for offline payments, our first membership level, a new course, and the course connected to the membership level, we can perform our first official test. Find the level we created earlier and find the URL. Copy the URL to your clipboard. Open a separate browser (I usually use Chrome, and I use FireFox as a secondary browser). If you don't have a secondary browser, then log out of WordPress in your current browser. Paste in the URL in the new browser window and hit enter to load up the page. Fill out the form with some generic information and click Sign Up. Now go back to your original browser. In the WordPress admin panel click Users. Find your new user in the list and check two columns. First, check the Active Memberships column to see if the newly registered user was added as a member. Second, check the Training Course Progress column to see if the user was enrolled into the course. You should see a progress bar for the course if they were enrolled. If you followed the steps carefully, you should have a new member and the new member should be enrolled into their first course. 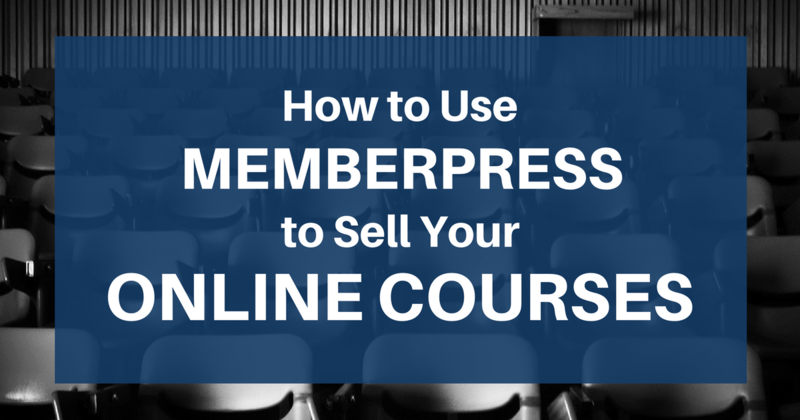 You've just proved that selling courses with MemberPress is easy! Before you start selling, we should perform a few clean up tasks. Click on MemberPress→Memberships and click on your membership level. Give it a price in the upper right hand corner as well as a Billing Type and Access Type. Next scroll down to the Membership Options and click the Price Box. While this isn't necessary to sell your product, I highly recommend filling out the information here. As our next step will be to create a "Group" page that will display pricing plans that look beautiful. Create more membership levels. Rinse and repeat the steps above to create your membership levels. Click MemberPress→Groups and click Add New. Enter a title and for the page content, you will want to place your sales copy for your membership site here. In the Group Options area, add your membership levels that you'd like to group on the sales page. Take note of the permalink and click Publish. Depending on how your site is structured, you can place a Join Now button somewhere on your site that directs them to the sales page. At the bottom of the page you will see all the information that you entered in step 3, and it should look pretty darn nice! Almost done. Now we just need to configure our payment gateway and we are done! MemberPress→Options and click the Payments tab. We need to remove our offline payment type that we used for testing. To do so click the "X" symbol and click Ok when prompted. 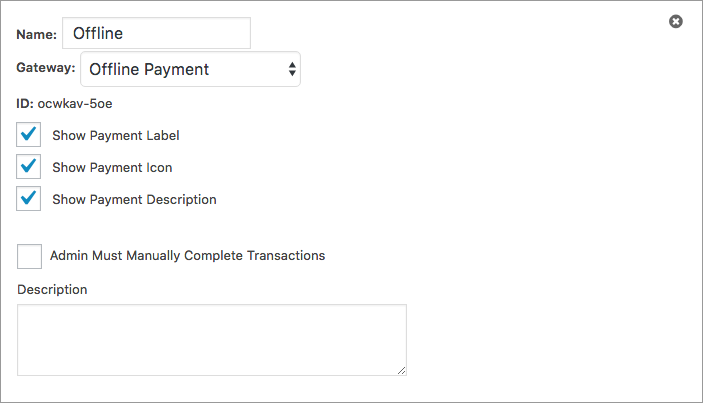 Now click the "+" symbol to add a new payment type. Give it a Name and select the Gateway. Fill out the appropriate information and click Update Options. I told you that selling courses with MemberPress was going to be easy. Now you're ready to make some money! Are you already using MemberPress to sell courses? Feel free to share your use case with us in the comments below!